Effective in your pet's mouth and healthy for their digestive tract. Eliminates bad breath, reduces plaque & tartar, and is economical to use everyday. 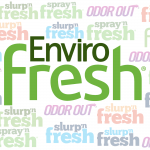 Slurp'n Fresh will also eliminate skunk spray from their mouth in less than 1 day. Simply add Slurp' n Fresh to your pet’s water, and in 24 hours you’ll be begging for a smooch. Fresh pet breath in 24 hours, it's that simple. Extra-strength for older dogs with tooth decay or gum disease. Specifically formulated so fussy cats won’t know it’s in their water! Simple and safe oral care for your new puppy.